In what will be the biggest bank deal since the wave of Treasury-backstopped arranged marriages that took place during the most acute phase of the financial crisis, regional lender BB&T on Thursday announced it would buy SunTrust Banks in an all-stock "merger of equals" valued at $66 billion - making it the country's sixth-largest lender, and a new potential rival for global lenders like Bank of America and Wells Fargo. 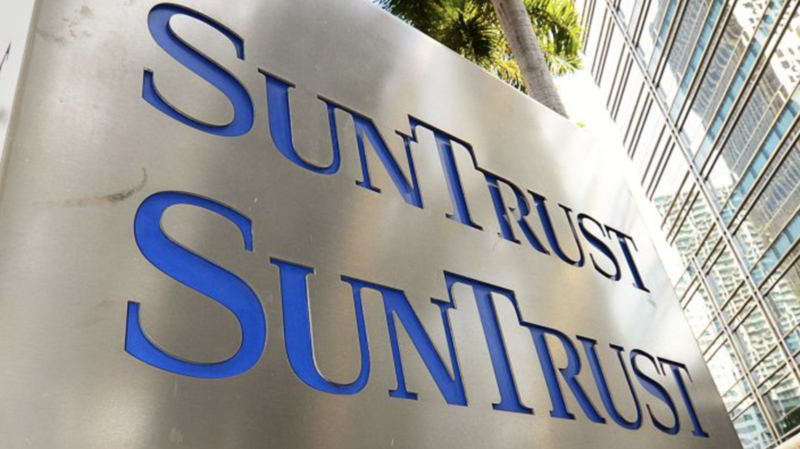 According to the terms of the deal announced in a joint statement on Thursday, SunTrust shareholders will receive 1.295 shares of BB&T for each SunTrust share they hold. Shareholders of Winston-Salem, North Carolina-based BB&T will own approximately 57% of the combined company, while Atlanta-based SunTrust’s holders will own about 43%, Bloomberg reported. All told, BB&T will pay $28.1 billion for SunTrust’s equity, a 7% premium to SunTrust's Wednesday closing price. The deal will also include almost $18 billion in net debt. The merged bank will have around $442 billion in assets, $301 billion in loans and $324 billion in deposits. But in a disheartening sign for employees of the two banks, the deal is expected to lead to $1.6 billion in cost savings as the companies take advantage of "synergies" - i.e. mass layoffs as their operations are streamlined and "redundancies" are eliminated. The combined bank will operate out of Charlotte, NC under a new name. BB&T Chairman and CEO Kelly King will serve as the CEO of the combined company through Sept. 12, 2021, after which he will serve as chairman for another six months. Ernst & Young expects a flurry of transactions this year, fueled by easing regulations and the U.S. tax overhaul, which helped lenders build a war chest to spend on acquiring new clients and technology, the financial advisory firm said in a report last month. The value of mergers and acquisitions in the U.S. financial-services sector more than doubled to $196.5 billion in 2018 from $82.3 billion in 2017, EY said. With President Trump promising a wave of bank deregulation, analysts have been anticipating another wave of consolidation in the banking sector. Bank of America Corp. Chief Executive Officer Brian Moynihan warned last month that this wave could lead to the emergence of another major competitor to banks like BofA in the American banking universe. But as banks cast about for strategies to boost revenue, there might be an even more important dynamic at play here. With revenue growth difficult to come by, cost-cutting becomes the most obvious strategy for boosting the bottom line. the deal is expected to close during Q4 2019.